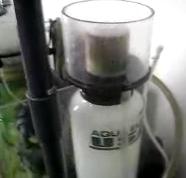 Having a Protein Skimmer in Freshwater Tank does not serve any extra function although it doesn’t hurt to have one. It is a waste removal system designed primarily only for saltwater aquarium whereby enhanced surface tension of the water will lead to formation of smaller air bubbles which is the key to the whole set up. Generally the main purpose is to get all the protein and other soluble organic compound attracted to the air bubbles and then float to the top whereby the collected materials will be forced out through a disposal cup and then clean water returns back to the system. Basically, the smaller the air bubbles the larger the surface area is, which means that more waste can be removed from the system. Furthermore, small air bubbles will take longer to travel to the surface and this will allow more time for it to collect the waste material. Therefore back to the question whereby, does freshwater tank benefit from having protein skimmer? The answer is definitely NO because the water itself does not create that kind of surface tension to allow formation of these fine air bubbles.